Ricardo Cabral is a Technical Engineer and also Microsoft Certified Trainer (MCT). In his free time, he is actively participating, volunteering and/or speaking portuguese community meetings. 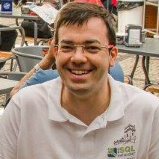 He is one of the co-founders of IT Pro Portugal and PowerShell Portugal user group. Ricardo is interested in technology with over 14 years of experience in IT management, development and projects. He is an authentic self-taught man. Ricardo holds a Degree in Computer Engineering from Universidade Autónoma de Lisboa. I Invite you to consult some of my Microsoft certifications in Acclaim.